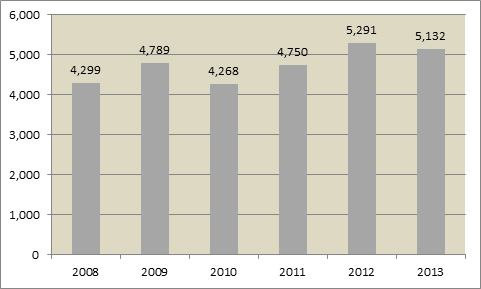 This post provides a general analysis of trends in the arrivals of permanent residents, temporary foreign workers and international students in Atlantic Canada over the period 2008-2013. This analysis is based on data obtained from Citizenship and Immigration, Canada. Atlantic Canada is home to about 7 percent of Canadian population. About 2 percent of permanent residents arriving in Canada annually are destined to this region. Most of the permanent resident immigrants destined to the region arrive in Nova Scotia (about 40 percent of total arrivals in 2013), followed by New Brunswick (32 percent). Province of Newfoundland and Labrador receives the least (13 percent in 2013). 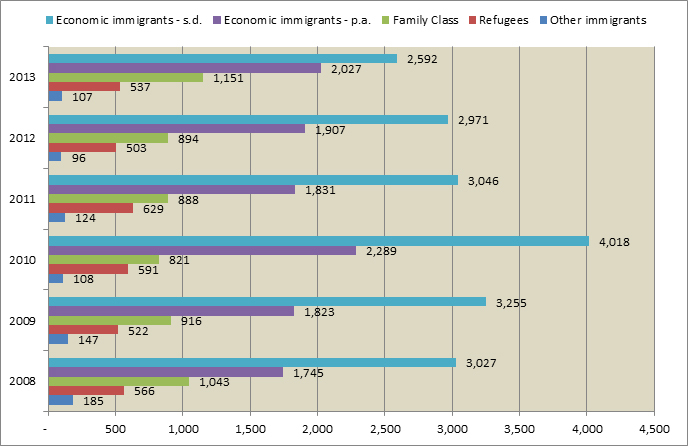 Most of the permanent residents arrive in economic class (Chart 3), followed by the family class. In 2013, there were 2.7 dependents (spouse and children) for every ten principal applicants who came under economic class. Asia and the Pacific region is the largest source of immigration for Atlantic Canada followed by Africa and the Middle East (Table 1). Arrivals from Europe and the United Kingdom have remained almost unchanged over the period while the arrivals from the United States have declined significantly. Among those aged 65 and over, most come under family class (Table 3).Source: Citizenship and Immigration Canada. 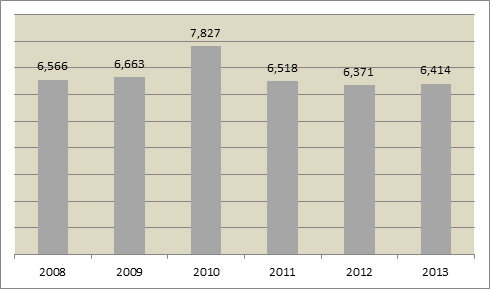 Men and women arrive in about the same numbers and this distribution has not significantly changed over the past five years (Table 4).Source: Citizenship and Immigration Canada. About 60 percent of new arrivals have ability to speak English language. 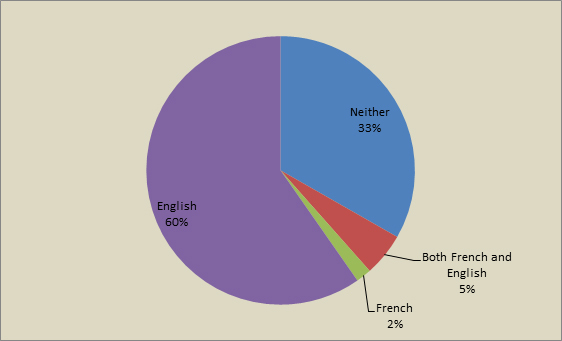 About 33 percent have no ability to speak either of the two official languages (Chart 4).Source: Citizenship and Immigration Canada. In 2008, among those who arrived in the 25-64 years of age group, 54 percent had a university degree (bachelor’s degree and above). In 2013, 57 percent of arrivals in this age group had a university degree (Table 5). The percentage of those arriving with a trade certificate or a non-university diploma declined from 26 percent to 22 percent over the period. Over the past 5-year period, the region saw about 19 percent increase in the inflow of temporary foreign workers (Chart 5). There were 10,865 new arrivals (permanent and temporary excluding international students) in Atlantic Canada in 2008 out of whom 39.6 percent were temporary foreign workers. 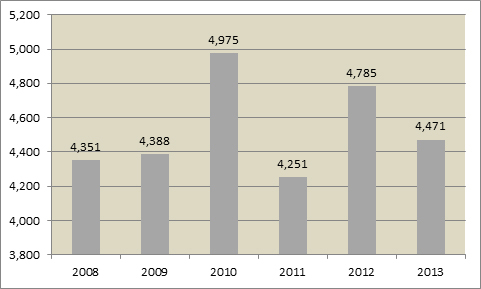 In 2013, there were 11,546 such arrivals out of whom 44.4 percent were temporary foreign workers. Atlantic Canada has also experienced a general increase in the inflow of international students over the 5-year period; however, their numbers have fluctuated over the period (Chart 6).